Quite some time ago (perhaps 12 years ago?) I was loaned a novel which I cannot remember the name of. Someone invents a way to create stable wormholes in time too small to travel through, but used to view events in the past. Results in the removal of all personal privacy, crimes are watched in court from any angle - nothing can be hidden. People begin to walk around wearing masks with projections from these wormholes on them, so you could be wearing the face of a Roman Centurion with his facial expressions changing in real time. I don't remember too much else about the finer plot. 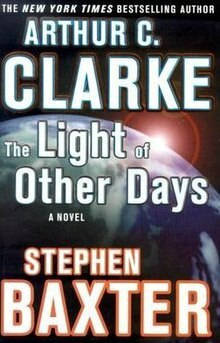 This is The Light Of Other Days, by Stephen Baxter and Arthur C Clarke. Just as you say, tiny wormholes are used to observe the past, with all sorts of societal changes as a result, the Death of Privacy, etc. Especial thanks to @user14111 who found the reference to masks which show the face of someone being observed through the wormholes.